4 gallon (15 l) solution and recovery tank for home or commercial cleaning. Solution tank designed with no-mess splash back protection and protective filter screen to remove debris. Comfort grip, adjustable handle with one-button activation and ergonomically positioned handle for balanced lifting. Fold-down handle for easy transportation in any vehicle. Optional hose and hand tool to clean upholstery, stairs, autos, motor homes, boats and other small areas. Quiet, lightweight, easy to use. Vac shoe with wrap around soft-sided bumper for surface protection. Large 10" non-marking wheels for easy transport and maneuverability. High performance vacuum motor for faster drying time. 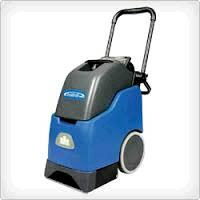 * Please call us with any questions about our carpet cleaner in Mason OH, Westchester OH and Cincinnati metro area.